To raise the standards of practice in political consultation, thereby enhancing the political process and improving public confidence in the Canadian political system. To provide professional guidance, assistance, and education to members as they develop the skills, techniques, and business procedures required for successful political consultation. 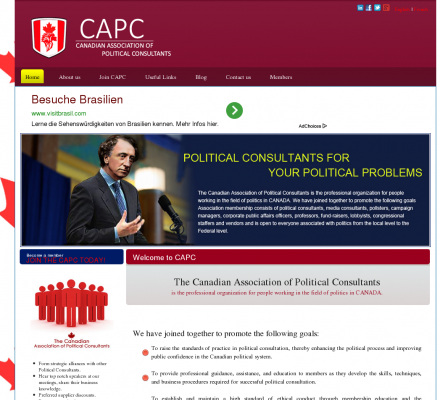 Description: The Canadian Association of Political Consultants is the professional organization for people working in the field of politics in CANADA. We have joined together to promote the following goals: To raise the standards of practice in political consultation, thereby enhancing the political process and improving public confidence in the Canadian political system. To provide professional guidance, assistance, and education to members as they develop the skills, techniques, and business procedures required for successful political consultation. South African Institute of Chartered Accountants (Popularity: ): Includes a searchable members directory and a description of accounting practice structures and certifications in South Africa. New York State Society Of CPAs (Popularity: ): NYSSCPA has over 33,000 members, eleven local chapters, state-level committees and their online CPA services. National Association of Black Accountants, Inc. (Popularity: ): Developing, encouraging and serving as a resource for greater participation by African Americans and other minorities in the accounting profession. Canadian Comprehensive Auditing Foundation (Popularity: ): National research foundation with publications and focus on non-financial performance reporting for public sector and corporations. Hong Kong Society of Accountants (Popularity: ): Information about the practice of public accounting and accounting standards in Hong Kong. Includes indices to the Society's three publications. The Oklahoma Society of CPAs Internet Resource (Popularity: ): Includes online CPE course search, online enrollment, membership information, consumer information, financial advice, CPA referral service, and student information. Forensic Accountants Society of North America (FASNA) (Popularity: ): Organization of independently owned CPA firms that provides a national network for conducting forensic accounting assignments. Malaysian Institute of Certified Public Accountants (Popularity: ): Includes a list of Malaysian accounting and auditing standards and a directory of member firms.